Sooo, since I've been doing cats in space paintings, I decided to take a stab at drawing dogs in space. I don't think I've ever drawn or painted a realistic dog before, so this was a new experience for me. I intended this painting to be a 2-3 hour speed painting, but after hour 3 into this project, I realized I used the wrong nebula for Canis Major. I accidentally drew M42 and M43, instead of a open star cluster M41. I ended up ditching M41 for a different nebula in the area of Canis Major. Still happy with that choice, but not happy that it took an additional 3ish hours to fix my mistake. Ah well. They just mesh so well together sometimes. actually using the nebula as part of the painting, that's so beautiful! Any plans for other Constellations, too? Depends! 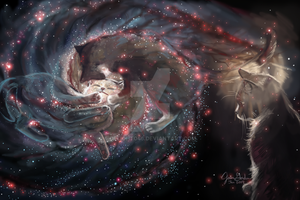 I actually wanted to go back to painting some spacey cats. XD I love kitties too much. I did know I wanted to do Saggitarius (that is my favorite constellation because it points to the center of the milkyway galaxy). 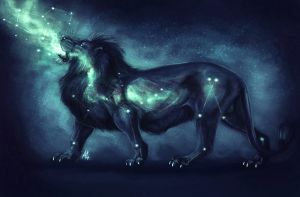 Also just did a google search, theres like 88 constellations. O_______O I'm not sure I can handle THAT big of a project. By "any plans for other Constellations", I certainly did not mean *All* of them , just select ones you'd choose, like you did with Canis Major, here (i.e. Orion, or Ursa Major, etc.). BTW: When you say "I did know I wanted to do Saggitarius (that is my favorite constellation because it points to the center of the Milky Way galaxy)", is that also in reference to the Saggitarius Alpha Star & Saggitarius Zero Star ( wikimoon.org/index.php/Sagitta… & wikimoon.org/index.php/Sagitta… / sailormoon.wikia.com/wiki/Sagi… ), from 'Sailor Moon'?